Exposé was replaced with Mission Control in OS X Lion by name, but that doesn’t mean some of the most useful functions of Expose are gone, and in fact what you could see in Expose is still around in the newest versions of Mac OS X, including Mountain Lion 10.8 and newer. One very popular feature was the application Expose feature, which revealed all windows for a specific app, and this is still around in Mac OS X but it’s now visible through a gesture combination. To access this app-specific Expose in OS X and display all of an applications open windows, move the cursor over an apps Dock icon and then do a three fingered swipe down. 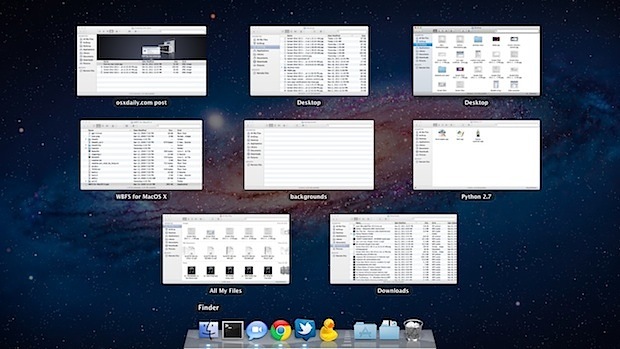 You’ll be brought to the familiar all-window view that was very popular in prior versions of the Mac. Depending on your Mission Control and gesture settings in Mac OS X you might need to do a four-fingered downward swipe instead. Performing the downward swipe in the currently open app has the same effect, assuming that app has more than one window open. If you attempt this trick and it’s not working, you likely need to enable it in your Trackpad gesture settings on the Mac. Go to System Preferences > Trackpad to do that. Update: for older Macs or those without a trackpad, you can access the same feature by using the keyboard shortcut Control+Down Arrow. Or you can get hyperdock from (http://hyperdock.bahoom.com/). You see all open windows when you hover the mouse over the app in the dock and adds some other useful stuff, as starting, pausing playback in iTunes from the dock with “now playing” preview on your dock. Hyperdock is a must utility for me along with TotalFinder (http://totalfinder.binaryage.com/). They do enhance my Mac experience daily! And what about if the dock is the left side? THANK CARL!!!!!!!!!!!!!!! I just got Lion and this was bothering me SO much. For my job, I have a lot of open “un-sent” emails and it was driving me bananas not being able to see everything. The double tap does not work for me, is there a setting I must set it as? I thought it had worked before, but I recently reloaded my Mac from scratch and it does not appear to work now. Thank you, thank you, thank you! I really missed that Expose feature and didn’t know it was still around. I wish you people would publish the Magic Mouse equivalence! This crap with gestures is just such a mystery! Is there some sort of manual where you can find a list of which commands are available???? of course if you just want to get to Expose without the four-down gesture… just press control-down arrow. Now try stand up.. spin around ten times really fast and press SHIFT-CONTROL-DOWN ARROW. YES this answer should have its own web page. I just discovered ctrl-F3 myself. it is very hidden but extremely USEFUL!! Running 10.8.5. Any way to show all windows from all desktops (without a trackpad) in Mountain Lion? I made the jump from SL to ML and the loss of that feature is really bugging me. I just accidentally did this: Ctrl shift and arrow up, which showed all windows. Ctrl shift and arrow down shoes application windows. Does it in slow motion but I’m still so happy I fpound this as the ‘all window’ thing missing bothered me too. Not as handy as a hot corner, but better than nothing.